Based on Google Search gargling means: To force exhaled air through a liquid held in the back of the mouth, with the head tilted back, in order to cleanse or medicate the mouth or throat.To produce the sound of gargling when speaking or singing. When you're in the process of medicating your mouth, all you need is mouthwash so that you will gargling. which serve as the best antibacterial protector for 12 hours. You will feel the long lasting fresh breath confidence. Your top reasons why one should not/need not gargle all the time/all day long! Some individuals may be unaware of the sheer benefits of mouthwash which exist. Although many may think that simply brushing their teeth is enough to help ward away germs and bad breath this is not entirely the case. 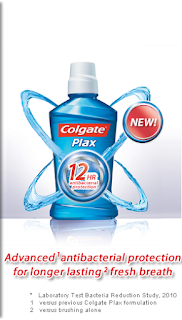 Colgate plax is clinically proven. Rinsing with colgate plax is an essential step in cleaning hard-to-reach areas in the mouth and the mouth rinse help in combating plaque, germ protection and provide healthier gums. It contains flouride to prevent cavities. I'm now no-worry-at-all, because using colgate plax makes my day totally happy and confident! Even at work, you can gloo gloo anytime of the day but with colgate plax only once, you will feel the freshness of your breath all day. I enjoyed gargling every after brushing my teeth. The feeling is like bomb ready to bang and jam with the people around.Freshening your breath is not only important to you and your nose but also those around you as well. Fresh breath is ideal no matter what setting you are in, whether it be work, home or out on the town. *Maybe your boyfriend/husband will kiss you torridly. *You'll get the guts to tell your crush how cute he is, so your confident enough to talk to him because you have a fresh breath. I created my own funny Gloo Gloo animated photo using Gloo Gloo Application to be able to join the contest.Click here to see the animation. I've sent it to my friends for them to know about Colgate Plax Application. So what are you guys waiting for? Gargle your way to winning a Samsung Galaxy Tab! =) Good luck! Let's all hope to win.